Square Enix may have held its hands up and admitted that Final Fantasy XV‘s presence at Gamescom was, despite what the hype would have had you believe, overly disappointing, but there’s still plenty to look forward to. Without a release date to call its own, there’s still much mystery surrounding the studio’s long-in-development RPG title, though today we’ve learned that Just Cause developer Avalanche is helping bring flying airships to the hotly-anticipated sequel. That’s according to famed Game Director Hajime Tabata, who sat down with Famitsu (via Siliconera) to discuss the new addition to Final Fantasy XV, and how he intends to bestow players with a greater sense of freedom with a game element that has long been a staple of the series. “I’m not certain whether we’ll be able to make it on time for the retail release, but I think we should do even if it means releasing it after as a download,” he said. “I’d like to have the challenge of being able to fly around the world. I would like to experience that, and I’m sure the fans would also like to experience that, too. Cross-pollination between two studios owned by the same publisher is by no means a rarity, though what gives Avalanche a significant advantage is its ability to render aerial sequences seamlessly with normal gameplay. As every bombastic slice of Just Cause 3 marketing attests, the studio has a knack for incorporating airborne action with the remainder of the game. Here’s hoping they can bring something novel to the table that gels with Final Fantasy XV‘s real-time combat system. 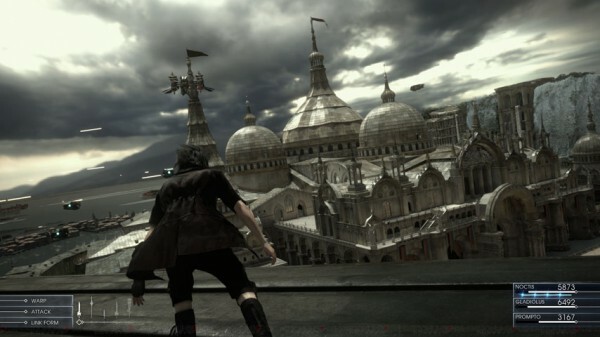 Final Fantasy XV is expected to release sometime before 2017.